So you want to enjoy kayaking but the investment in time and money is perhaps holding you back? Is the thought of rescue procedures, eskimo rolls and expensive equipment like fiberglass kayaks and professional helmets making you think twice? We have the perfect solution! There are plenty of alternatives for the novice kayaker, recreational paddler, and kayak fisherman. One of them is the sit-on-top kayak. Sit-on-top kayaks are similar to traditional sit-inside kayaks, or canoes, but instead of sitting inside the vessel, you sit in a moulded seat on top. Some are fiberglass, but most are made of durable polyethylene using the Roto Mould system. This means that the kayak is moulded out of one piece of polyethylene, which makes it much more resilient. Sit-on-top kayaks share many of the benefits of traditional canoes but tend to be easier to use and less expensive. 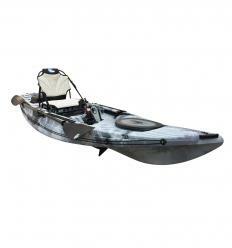 There are sit-on-top kayaks designed for fishing, surfing, expeditions, scuba diving and more. Some of these have specialised designs, but most sit-on-tops are designed for multiple uses and are created with the recreational or amateur paddler in mind. Aside from being easy to use, sit-on-top kayaks have many advantages over sit-inside kayaks, among the most important being comfort! A traditional sit-inside kayak can feel constrained, especially for those with longer legs or those who have more limited flexibility. 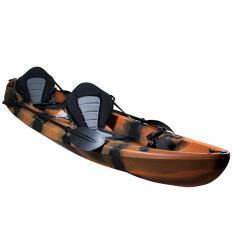 A sit-on-top kayak feels more open and gives the paddler more freedom of movement. Another important advantage is the simple rescue procedure. Safety is important for everyone, whether a beginner or a more advanced and expert kayaker. Sit-on-top kayaks have an open deck instead of a closed one, which means less risk of getting caught in the boat if it were to tip over. With a sit-on-top kayak there is no need to practise eskimo rolls or wet exits. These features make sit-on-top kayaks especially attractive to people who are new to the sport, and people who do not plan on doing long expeditions, but rather prefer to kayak for leisure. Sit-on-top kayaks are fun for everyone, and a great way to begin to enjoy kayaking! All Galaxy Kayaks are self-draining - an important point to consider when buying a sit-on-top kayak. 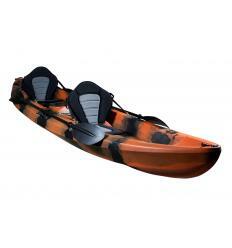 Kayaks come with several drainage points specially placed along the kayak. These come with rubber “scupper plugs”. Plugs are best left in place, except in situations when your kayak will fill with water (such as when surfing waves). If unwanted water gets in the kayak for any reason you can remove it by removing the plugs from the affected area, and picking up some speed by paddling ahead. This inertia creates suction and draws out the water that’s inside the kayak. As soon as the water has drained, place the scupper plug back in. 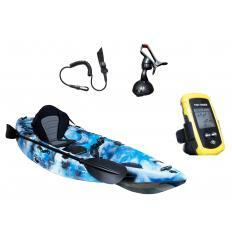 Every kayak sold by Galaxy Kayaks comes fully equipped with a multitude of accessories. 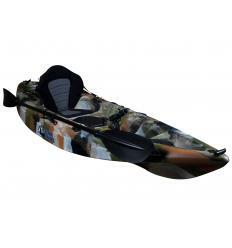 These include a detachable two-piece kayak paddle, a padded seat, hatches, splash bags, scupper plugs for every drainage hole, side handles, bow and stern handles and D rings. 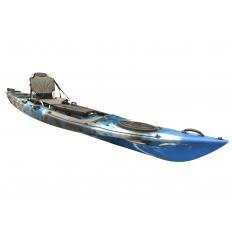 All the fishing kayaks also come with flush mounted rod holdersand swivel pro rod holders as explained in the description of each kayak. These vary from model to model and are clearly labelled on the description of each. Finally, all of our Kayaks are made of 5mm polyethylene using the Roto Mould system. Every kayak sold by Galaxy Kayaks comes wrapped in two layers of plastic and protective cardboard. The first layer is a protective cardboard sheeting followed by a layer of bubble wrap and a third plastic cover. All accessories are packaged inside the wrapping and some of the smaller items are stored directly inside the hatches for safekeeping. Owning a Galaxy Kayak means you have our full team support and technical assistance available when you need it. We are here to help and assist our customers with any problem they may have and with our years of experience behind us. Every kayak sold by Galaxy Kayaks comes with its logo moulded into the kayak. These are thermo sealed into the kayak hull using Mould in Graphics technology. 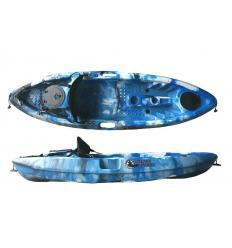 The brand is there as a guarantee of Galaxy Kayaks certificate of quality. We are not responsible for other brands imitating Galaxy Kayaks. Rest assured as every hull comes with a 3-year warranty as standard! Life is an adventure – discover more with Galaxy Kayaks.